My kitchen makeover is getting so close to being done! 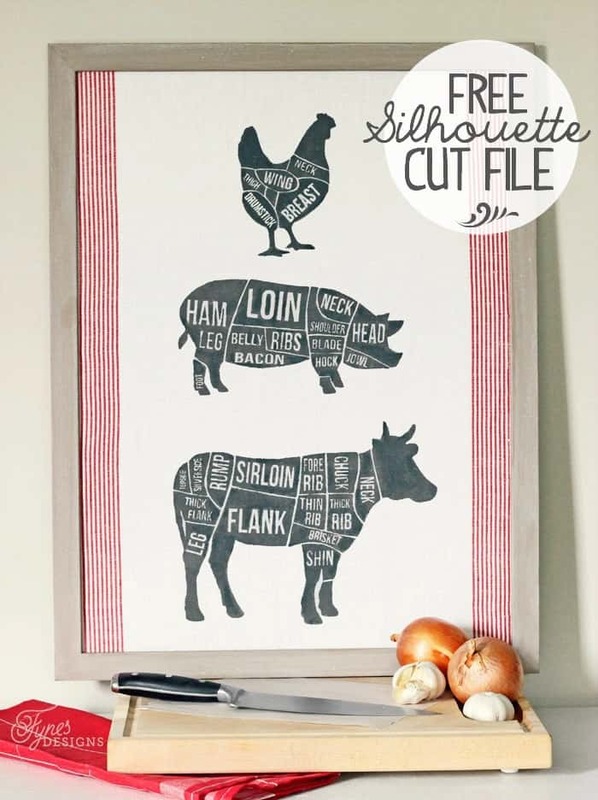 Yesterday on Facebook is shared a snippet of my new backsplash, and today I wanted to share my Butcher Diagram kitchen wall decor with a Free Silhouette cut file. I’ve always admired butcher prints, maybe because I grew up on a hog farm. I’ve seen some lots of different ones on etsy, in restaurants, and at the meat market but I wanted to create something original. When I found a roll of vintage tea towel fabric I knew I had to incorporate it into my kitchen makeover. Then I came across this poster frame at Value Village (for only $2.99!) and my kitchen art vision quickly came together! A few months ago I professed my love for fabric paint when I shared a tutorial for ‘How To Use Fabric Paint‘. I had a lot of extra paint leftover from my Fabric Ink starter kit from Silhouette, and I couldn’t wait to make another project! 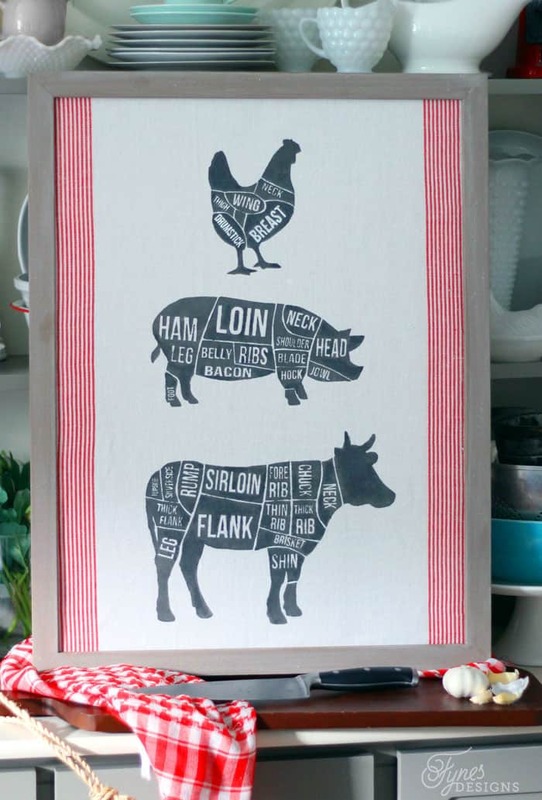 Follow the easy fabric paint tutorial to create your own fabric printed butcher diagram. You can see I had a little bit of bleeding under the stencil material because the tea towel fabric is textured. I actually like that it is a tad uneven, it lends itself to a more vintage look. Tea towel meet the meat market! I painted the Value Village frame a soft beige to co-ordinate with the rest of the kitchen decor. The poster frame had a sheet of plexiglass in it, but I thought having it mounted with no glass would make it look much more natural. 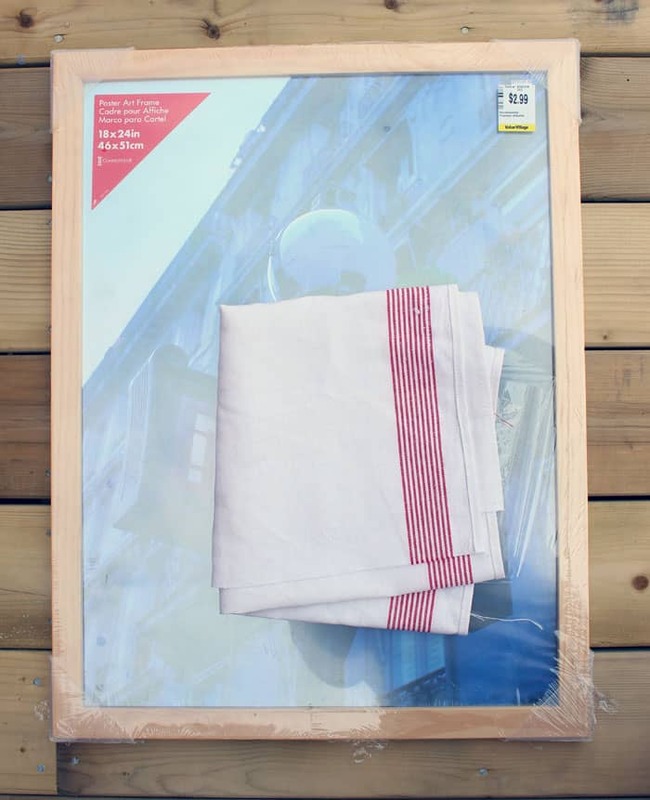 I sprayed the backing cardboard with spray adhesive and pressed the tea towel onto the backing. It was perfect because the adhesive is reposition-able… getting those red lines matched up with the edge of the frame was a bit of a task! 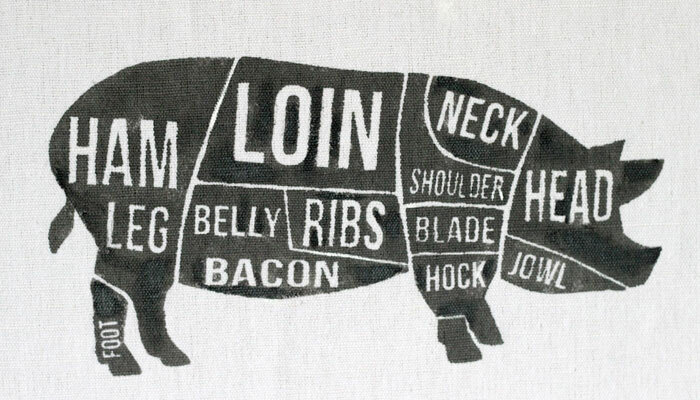 I really love how this butcher diagram wall art turned out. It will accent the rest of my modern farmhouse kitchen decor perfect. I can’t wait to show you the rest of my kitchen makeover! Wish I had wall space left in my kitchen for one of these!! But I’m thinking tea towels would be nice too! Got to spend some time getting better at the Silhouette machine! YOu certainly do! I couldn’t craft without it now! This is fantastic! I love my Silhouette and my hubby loves to cook. 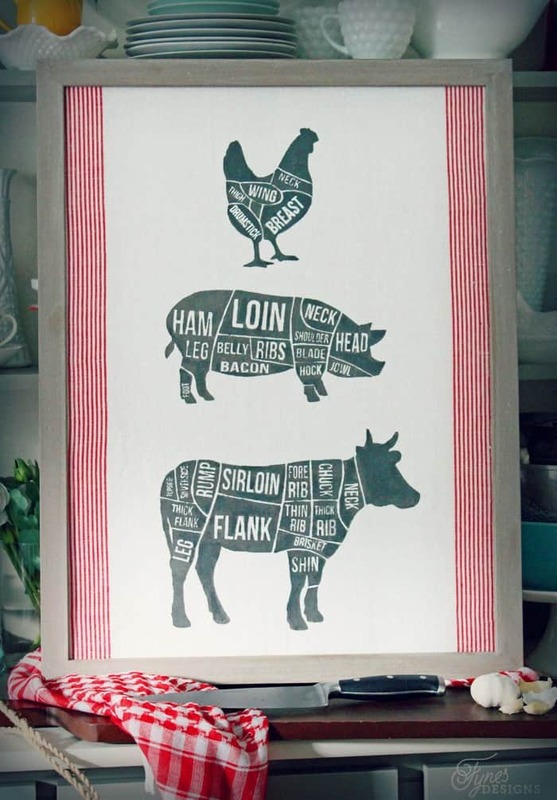 I’ve been thinking about finding some kind of butcher print like this to add to our kitchen, but thanks to you I can make my own! Love it! Awesome Kelly, I’m so happy to hear you’re going to use it! This is so cute! Is it possible to make this into a PDF to print and frame for those of us that do not have the machine? Thanks so much for this great file! Your kitchen is coming along so well, Virginia! I’m totally squiring away your freebie for our kitchen someday! Thanks! I hope you get to put it to good use! Love this print! Would love to be able to download it. What program are you using to open it? Malinda, This is actually a cut file I created for the Silhouette Studio. I should make it a printable though! Hi Kim, you’re making it hard on yourself, sorry I didn’t explain. The file is as is, you should be able to open it, press cut and go! Good luck, I’d love to see your finished results on Facebook! I’m sorry Alyson, I tried to before and never liked selling very much. Thanks for visiting! Thank you for providing the cut file!!!!!! Love this creation. Is it a no no to use the free cut file for commercial use? Thanks. If you buy a commercial license it shouldn’t be a problem. Each design comes with its own set of rules. Is there a way you can make this into a jpeg, so i can use it with my cricut?? ?